With Mario Kart 8 now around the corner, it's an ideal time to begin looking both forwards and to those predecessors that made the series such an integral part of our gaming lives. Super Mario Kart on Super NES started it all, with its Mode 7 visuals and terrific design winning over millions of gamers. It's the the 16-bit racer's credit that it stands up well today, even if its gameplay is far removed from modern day entries. It's also the source of an ongoing competitive gaming scene, as dedicated players from around the world regularly tackle each other's records and gather to compete. One of the very top elite players in world Super Mario Kart competitions, Sami Cetin, is based in the UK and does much to promote the karting original and, by extension, Nintendo. While not setting world records and competing he can often be found at expo events, gaining plenty of fans in the retro and Nintendo scenes. 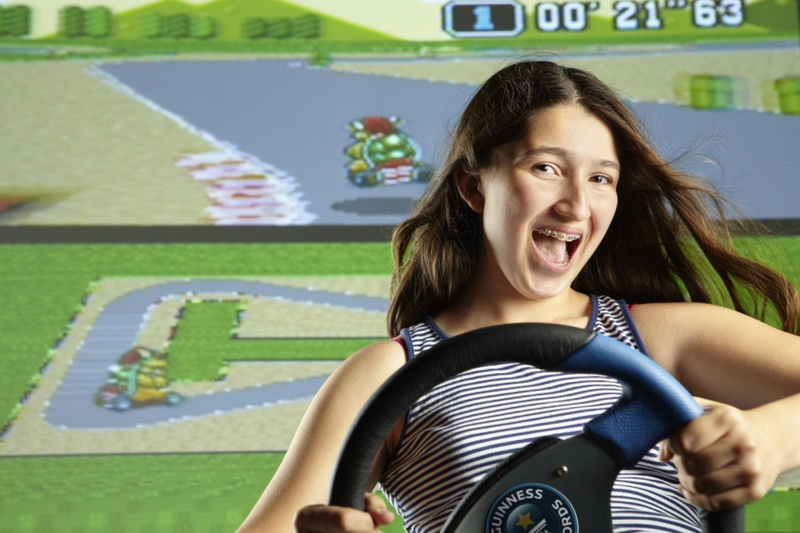 We've caught up with Sami to talk about his Super Mario Kart record-breaking, his world-leading niece who's joined him at the top table for the SNES title's competitive scene, and gauge his thoughts on the newer entries. To kick things off, can you please tell us about your background as a gamer, and your first memory of playing Super Mario Kart? I started off playing old PC games with my older brother Hakan many years ago and played on the NES with my cousin and her friends. When I was 9 I got my own one with Super Mario Bros, and later the sequels; not long after the SNES was released and Super Mario World was the big game out at the time. Following that in Christmas 1992 Super Mario Kart was released — my older sister bought it for me then, and I was 10 years old. It was simply just a game to play for fun at first, and I didn't realise what it would become for me years later. Why did you decide to focus on a SNES game from 1992 to hone your skills and to chase records? For one particular game, Super Mario Kart on the Super Nintendo, I managed to very early on figure out how to drive on the edge of the road consistently with the fastest racers. It was in 1993 – 1994 and this was without the internet back then. There were a few records in magazines at the time and more abroad but I didn't have contact with these players yet, so when I got online in 1998 I searched the current websites for the World Records from National Champions in several countries and decided to create a much larger community; this became the Super Mario Kart Time Trial World Rankings (http://www.mariokartplayers.com/smk) in November 1998, which I have run weekly since. From there the rankings have massively grown and players from all round the globe are competing for the fastest records and on multiplayer. I believe like other classic games, it was a combination of the simplicity but also technicality of the original where you require very good hand-eye co-ordination and timing plus technique and strategy to win. This really captured the interests of everyone including myself in Super Mario Kart SNES). How long have you been involved in competitive gaming, and what experience motivated you to dedicate time towards pursuing a higher rank? I did play Time Trial in Super Mario Kart prior to starting the World Rankings, but stopped at intervals when I was at University or had other commitments; it's been on and off for 20 years now. I've been more seriously into Time Trial in the last 15 years, and on the World Wide Super Mario Kart Championships and events abroad since around 2007. I believe the motivation was finding something that I could do really well at and compete at a high level. Everyone has a special skill they can use whether it is in games, sports or some other hobby / pastime. Also training other players was fun as we could enjoy the events as a team and practice together. As the World Rankings got more populated it motivated everyone as the statistics were always fun to look at and create rivalries between players at similar skill levels. How does a gaming audience react to your driving skills? Super Mario Kart demands concentration for a perfect run, so does it distract you when a race or Time Trial attempt is being watched? For the casual Super Mario Kart players and Semi-Pros from the 90s, if they haven't seen the level we play at, it is mostly a surprise. More on the difficult technical tracks such as Vanilla Lake 2, as an example, as the shape of it looks like you can't make it round at full speed. I think initially when performing in front of a crowd for the first time it can make you nervous, but after some years I am used to it and I don't mind making mistakes on some demonstrations; it is normal to do so as it is part of the learning curve. When racing at the World Championships it is very tense, but again everyone in the room is in the same boat, so there is an element of nerves but if you can control that fear then you stay focused and can perform the best that you can do. 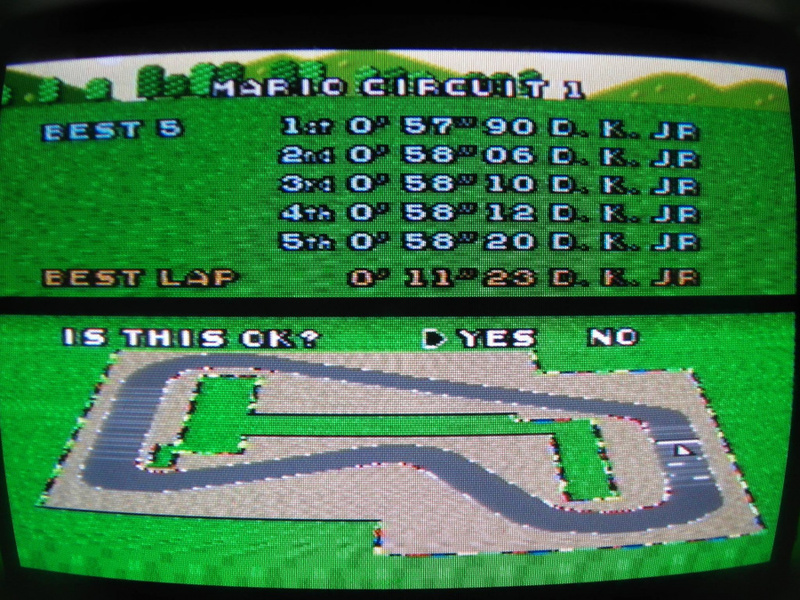 Can you tell us about your December 2013 Time Trial world record - on Mario Circuit 1 - using the PAL version of the game? The Super Mario Kart Time Trial World Records section of the Mario Kart Players website also notes that you currently hold a few other records. Can you tell us more about these and when they were set? Yes I hold some World Records on other tracks, as I am currently 2nd in the World on PAL (after my rival and friend in France, Guillaume Leviach who currently holds the overall title on both PAL and NTSC based on average finish scores). The top 4 or 5 players are so closely ranked that we all have our own favourite tracks. These include Donut Plains 2 lap, Mario Circuit 3 course and lap, Donut Plains 3 lap, Ghost Valley 3 course time, Vanilla Lake 2 lap and Rainbow Road lap (also Mario Circuit 1 and Ghost Valley 3 on NTSC). Most of these I reached in the last year or two, the most recent being the NTSC improvements. Just recently, in February 2014, you set two NTSC records; can you tell us more about that? Yes, I decided to improve some on the NTSC rankings, which has a lot more American and Japanese rivals, plus a number of Europeans who also compete on the NTSC consoles. In February I improved on Ghost Valley 3 which I enjoy playing and set two World Records live at the Games Expo East Kent 2014 (GEEK 2014) in Margate in February. Do you prefer competing using the PAL or NTSC version of game? The PAL version, as I find the turning angles and mechanics are better for me, plus it was the version I played from the beginning — that said I am happy to compete on both whenever there is a challenge. Are there any personal Super Mario Kart triumphs that you would like to share? What are your other most memorable moments from a tournament, event, or a record attempt? 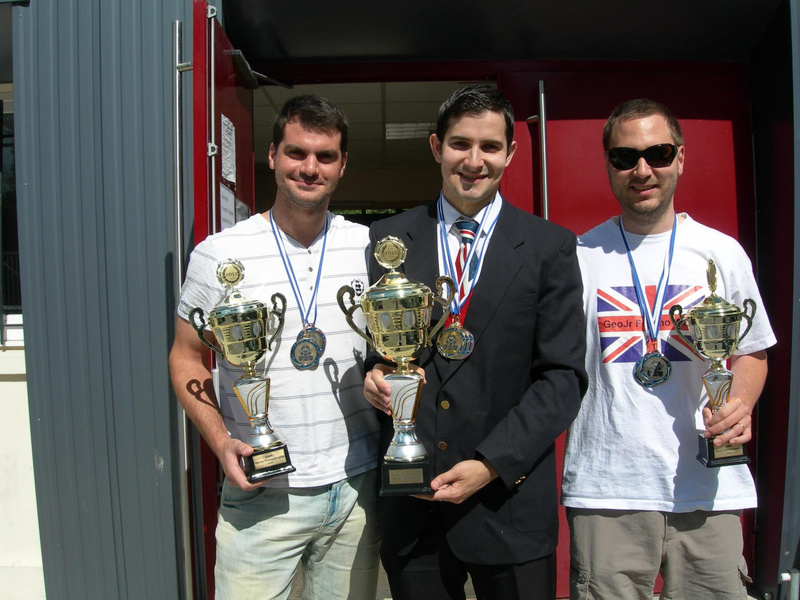 The 57.90 World Record on Mario Circuit 1 as mentioned, but also winning my first international Match Race Mode Tournament in 2009. It was a bit of a controversial one as I got lucky with a few lightnings. But I went on to win three more of these without lightnings and more general strategies which helped me prove to myself I could do it. However, the World Championships combines all of the modes which makes it a tougher game. 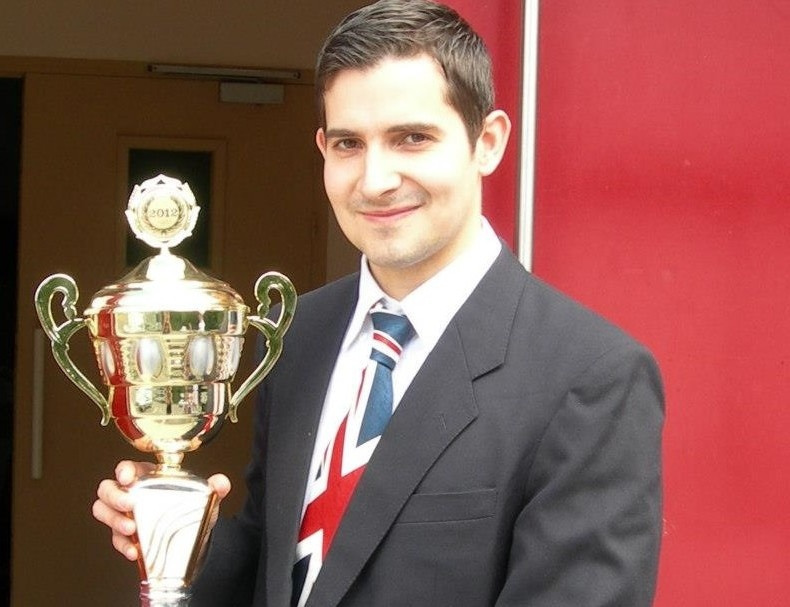 Which leads me to my other favourite achievement which was winning the 2012 World Championship, we had a great crowd there from the UK including the Top 5 players in the UK and my niece Leyla Hasso who is the female World Champion, making her début that year. It was also the 20th Anniversary of the release of Super Mario Kart which I think made it that bit more special to happen on that particular year. If you had to choose one circuit in Super Mario Kart, which is your favourite and why? As mentioned Mario Circuit 1, as it was the official track in Japan for Time Trial back in 1992 – 1993 time, so I think this history motivated me to push that one as far as it would go, and later for my World Record achievements; as this is the first ever Mario Kart track in the entire series I feel it is nice to hold this record. If I have to pick a few other tracks, I would say Vanilla Lake 2, for its crazy techniques, and Ghost Valley 3, plus some others that are fun in racing such as Choco Island 1, as you can do a lot of cool long-boosting techniques with mushrooms. Please tell us more about the origins and objectives of the Super Mario Kart Time Trial World Records and Players' Site. How can a Super Mario Kart fan participate, and what are the PAL and NTSC system guidelines for competing? Is it more for expert drivers, or for gamers of all skill levels? I originally created Time Trial World Rankings so there would be a huge library with as many players around the World on it. We have managed to document to best players ever in so many countries with their best times; we always encourage everybody to get involved. Since 1998 we have a very wide spread of skill level there, so that includes several casual level players, first time beginners plus intermediates, Semi-Pros, Pros and so on up to National and World Champions. So the site, as per its counterparts for the other Mario Kart games are known as Players' sites as they welcome all players. It is about more people and a greater community. It started out with National champions and some recruits in the 90s, and flourished from there. There are literally players improving records every week since then from around the World. To join up one simply needs to do a full time set on all Time Trial tracks (a course time and best lap from Mario Circuit 1 through to Rainbow Road) and they can send them in to us via our yahoo group page found on the rankings, with their name, country, system (PAL / NTSC) and character used. A Super Nintendo console must be used, not an emulator. There are validation requirements as players hit fast records, and they can easily record replays of their time trial records. Most players are good with this and upload to their own YouTube channels. We also meet up often to set some records live, either at our Championships or other events. What's your favourite character for competitive racing? Also, which size classes and characters are most popular with competitors, and why? There are four character groups, and each pair have identical driving statistics. They are D.K.Jr / Bowser, Mario / Luigi, Yoshi / Princess, Toad / Koopa. My personal favourite is D.K.Jr but I'm happy to use Bowser in racing. The heavyweights have the fastest top speed by far so all of the Time Trial Records are ultimately set by them. On battle mode you would be better using any of the others for safety as you need acceleration and sharper turning more. There I will normally choose Toad or Koopa. What sets the different characters apart and makes that vital difference in performance? The main thing is top speed, when you are playing against the computer at home it doesn't matter much. But if you want to go for a World Record or race against a top player, you definitely don't want to take Yoshi up against a Bowser player. When you are competing in the World Championships, it really is all or nothing and down to tiny mistakes, good item strategy and a small luck factor with the item probabilities. Thankfully the items are a lot more balanced and less extreme in Super Mario Kart SNES as opposed to the later versions, so the races are more down to pure driving skill and strategy. When two experts compete in either a GP or a Match Race, how advantageous or risky is it to use a feather power-up to help towards a win? Are any shortcuts frowned upon, or considered an unsportsmanlike route? There are some really cool looking shortcuts that can be taken with feathers and long boosts with mushrooms; they do cut large portions of the track but the problem is if you miss, you could lose the whole race. It doesn't matter how skilled we become, it is still easy to fail some of these harder strategies under pressure. There are some lap skip tricks which violate the finish line boundaries and these are banned at the tournaments as they ruin the track and simply do not look interesting to drive. Do you predominantly compete in Time Trial, GP and Match Race competitions at events, or are you trained in Super Mario Kart's Battle Mode, too? In recent years I try to compete on all modes on an equal basis, mainly due to the World Championships. I have won Gold medals in all of the racing modes and Time Trial before; battle mode I have played less as it is a completely different game to the others. There are some very strong competitors in USA and France there and I normally place as a high quarter finalist. Hopefully over the next few years I may have an opportunity to break through and reach a medal there. In our Wii U eShop review, we praised the sound compositions by Soya Oka and Taro Bando in Super Mario Kart. Are there any tunes and ditties from courses that energise you most of all to win a race? I think the music is awesome, in many video games they have composed for, not just Super Mario Kart. But the thing we listen out to more are the sound effects, such as the zoom start timing, and when a tire brushes against sand / grass so we can tell if we have slowed down a little when the engine sound changes. Sometimes what you hear is important to help you win a race; when we are very focused we don't always notice the music, but definitely appreciate that it is there. What are your favourite Mario Kart games, apart from Super Mario Kart? Are you looking forward to Mario Kart 8 on Wii U? I am not sure if I will have time to compete at later versions due to various commitments outside of Super Mario Kart; however I will be keen to give Mario Kart 8 a try for fun and join in the Time Trial World Rankings there just to be a part of it when it is built around release time. I still need to acquire a Wii U as well… other than that I had a history of competing on Time Trials for both Mario Kart 64 and Mario Kart Super Circuit where I managed to hold site / World titles briefly around 12 years ago. Since then I haven't competed much in them but glad to see that they are very active as per Super Mario Kart SNES, and I really hope to see Mario Kart 8 do the same. I also reached a good level briefly on Mario Kart DS, but retired in 2006 when the prolonged boosting (PRB) strategies were being worked on by other players. It was at this time that international competition was being planned and arranged within Super Mario Kart SNES so I felt drawn back to the original, which was by far my strongest version. Your niece, Leyla Hasso, became the women's Time Trial world champion — using the PAL version — at only 13 years of age. Can you tell us about her achievements, and how did your expertise influence her to master this game? Leyla started in games very early; she was born in 1999 and in November of the same year when she was 5 months old she was already playing games on the PC such as 'Baby Type'; which was a cool program which had different sounds on the screen when different keys are pressed, so it effectively turned the PC into a musical instrument. Rumour has it that she also helped out updating the site at this young age! We then played on the original Game Boy and first Game Boy advance a couple of years later; so she got some experience in a few different games. By 2007 at age 8, I had trained her to use the heavyweight characters and she was setting much faster records, reaching the fastest female player in London and 2nd fastest of the UK. The main techniques I showed her was driving the classic methods how I learned in the 1990s, then she could learn everything from the ground up and would benefit from this at a later stage. She then joined in a Multiplayer competition vs Vincent van der Fluit of the Netherlands at a video game event run in Fairfield Halls, Croydon, South London in October 2007, where she had a victory on a 150cc Final. After a couple of years of inactivity she made a big return at 12 to rise on Time Trial mode. She passed Tanja Brüser (neé Brönnecke), of Germany on the rankings to become the fastest female player of the World on PAL and later competed on NTSC to gain the title there from Yukiko Takada of Japan. Guinness World Records also published her achievements in the 2013 Gamers book and 2014 main book. Several other videos of Time Trials and Races at Expo tournaments can be seen at her YouTube channel. Leyla is now my main sparring partner on Super Mario Kart leading up to the championships and any tournaments we may be taking part in. Leyla has taken part in the Super Mario Kart World Championships 2012 and 2013, the latter of which she has placed in the Top 16 overall. Here is a photo of us from the final day of last year's World Championship. Super Mario Kart was released several years before Leyla was born. Do you think it is harder for a younger gamer to become adjusted to its gameplay, because Mode 7 tracks feel different when compared to modern 3D racing games? If the younger generation have started on modern gaming then years later tried out mode 7 racers on the SNES then, yes, they may find it difficult to adapt. However we have some other young gamers in our Team UK who have reached a high level on classic games including Super Mario Kart. With patience and willpower to reach some goals it can still be done. In Leyla's case when she was younger I introduced her to 8 bit and 16 bit games so she had a similar background in gaming that I did. You recently helped us to produce A Look At the Super Mario Kart (SNES) World Championship 2014. Could you summarise the key points for a gamer to learn about the 2014 event in France, both as a visitor and a competitor, please? The Super Mario Kart SNES World Championships are held every year in France, and it is open to all players of any skill level, so we encourage anyone who wants to take part to let us know. Join the Time Trial World Rankings first and foremost to improve your driving skill level, and play some multiplayer with a friend, or meet up with some of the team in London (if you are UK based), or other teams abroad if you live near the other competitors to get some multiplayer practice in. Playing as part of a team, in particular, is a huge highlight for me. This is a game where you can learn very fast. We have seen players massively improve from year to year and it is wonderful that more people from around the globe are taking part. It is also great as a spectator as the hall and setup is fantastic. The final stages in the bracket are awesome to watch as the races are always close; last year the event was featured on Twitch TV, and it will be again this year; so those who can't make it will be able to watch the live streams from home. Registration is possible from www.ffsmk.org. Please do contact me directly if you are keen and I will be happy to answer any questions on joining up. The best thing about the events is the people you meet and the friends you make, so definitely get involved. 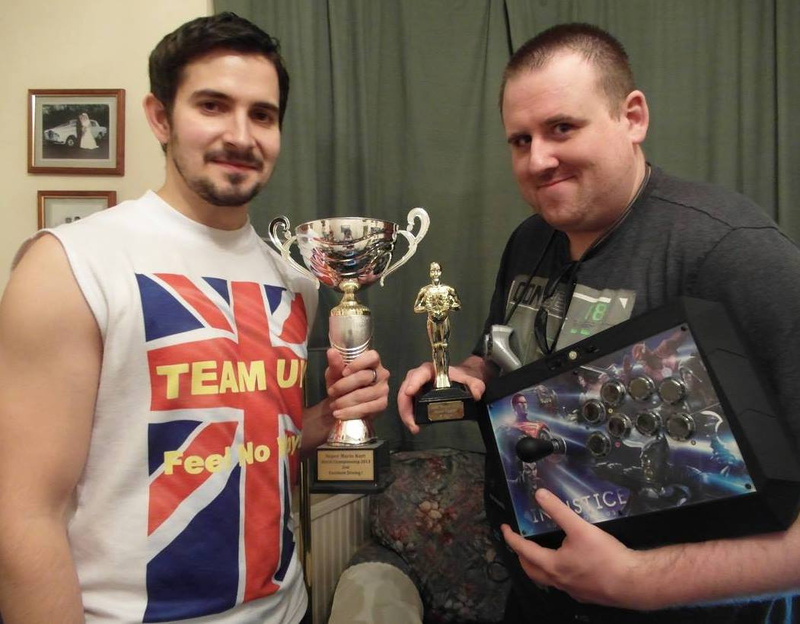 Have you met many other record holders / gaming Champions through your record setting career? 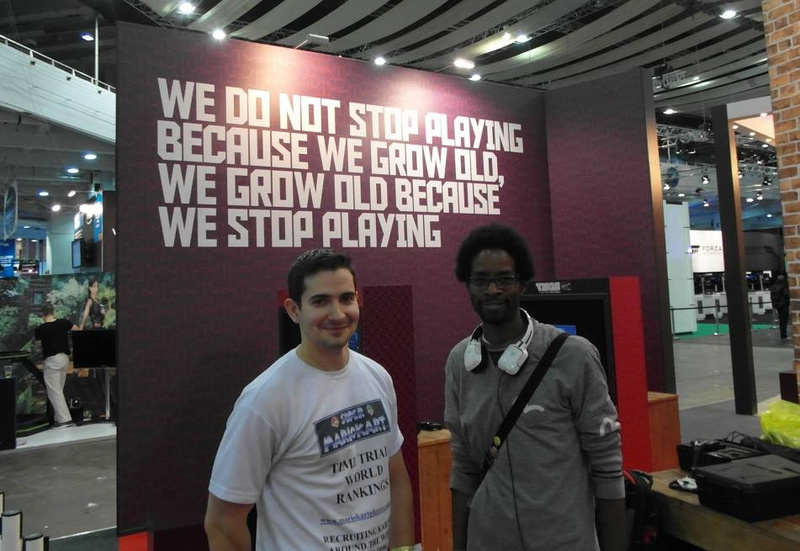 Yes, I have had the opportunity to meet a number of gamers from around the World; one in particular was Ryan Hart (a UK Champion at several fighting games including the Street Fighter Series). 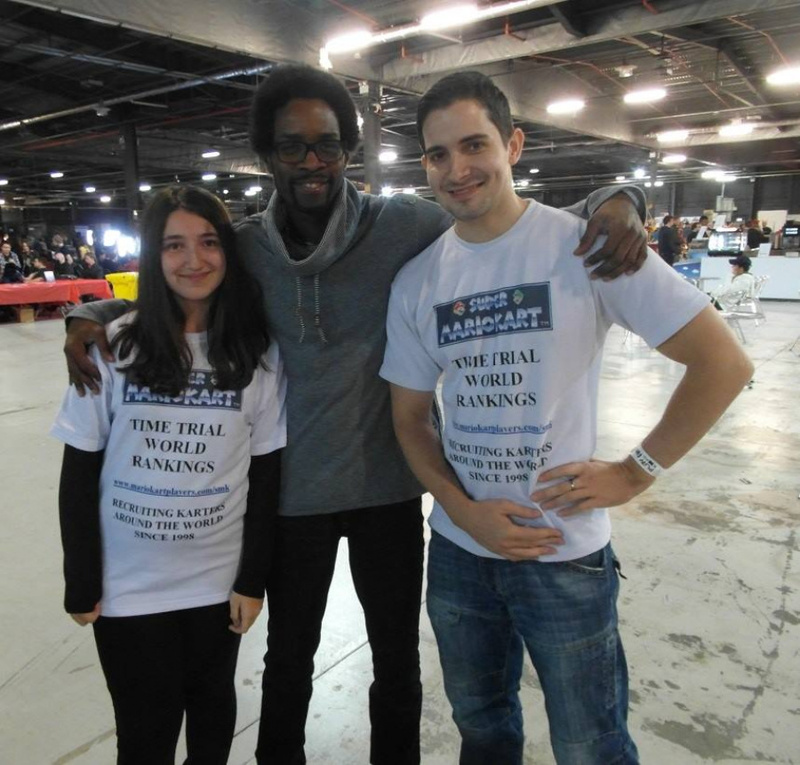 We were both featured in the Guinness World Records : Gamer's Edition 2012 for our achievements. Since then we have had the opportunity meet at some of the video game expos and represent our particular genre of gaming. I always think it is great for each of the gaming communities to show each other what we can do; and very enjoyable to watch others perform records / gaming skills. What other tournaments, expos and events are you attending throughout 2014? Where and when are they held? 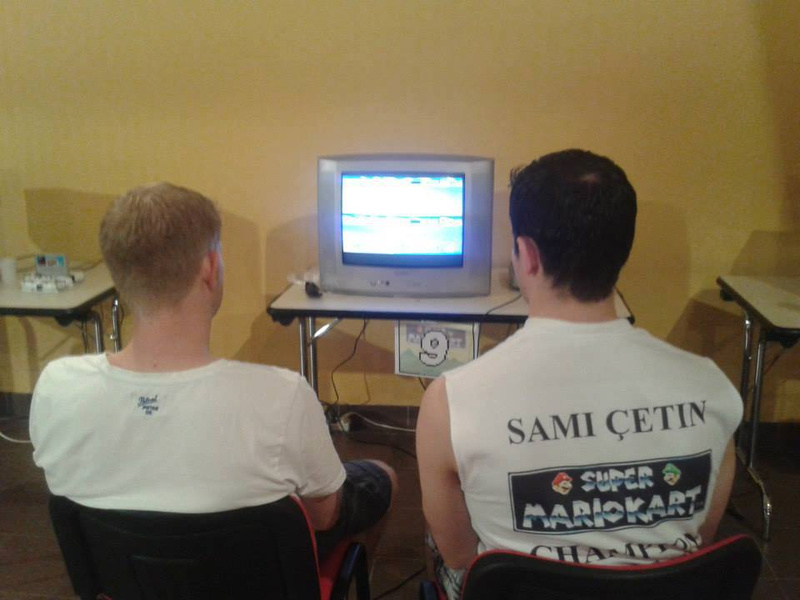 We help out a lot with Replay Events Ltd and run Super Mario Kart Tournaments for them across the UK at some of the large Expos. Leyla and I have attended the Games Expo East Kent in Margate most recently; I will be visiting Play Blackpool this weekend (3rd / 4th May) and the London Film and Comic Con in July 12th – 13th weekend. The two larger events in autumn both Leyla and I will be attending which is Eurogamer Expo (EGX) in London on the weekend of 27th – 28th September and Play Expo 2014 at Event City near Manchester on the 11th – 12th October weekend. So if you would like to meet us and do some races plus discuss anything to do with the World Championships, please do look for us there. For someone who spends a large amount of time with a SNES classic, are the 16-bit days your most beloved Nintendo era, and do you have any other favourite Nintendo systems? Yes, 16 Bit was my peak of gaming Era as I was aged 10-14 during this time, and I am glad to have started out at this time. I have many friends who are also in their early 30s now and share the same feelings about the games of this time. However I did also collect a number of great N64 titles and enjoyed them, more for chill-out gaming during the holiday times. So I would say N64 next, but I also really like the NES. What are your most-played Nintendo games, besides Super Mario Kart? Probably all of the SMB series on NES, Super Mario World, Donkey Kong Country series, several Zelda games, and one of my other favourites was Banjo-Kazooie and Donkey Kong 64 on N64. Definitely classics that all of us keep going back to. Do you compete or attempt records in any other racing games? Outside of the other Mario Kart games I also hold a couple of UK records on the original F-Zero on the SNES and am ranked 2nd in the UK and 12th in the World overall (probably 15th – 17th taking into account a few more Japanese players we knew outside of the rankings). This was another Mode 7 favourite, and unfortunately only 1 player, but Time Trial was awesome. Very tough though as you had to do some of the tracks on the Grand Prix mode in order to set records. Other racing games on the SNES that I have World Records on are Stunt Race FX, Street Racer and some UK records for Micro Machines 2 : Turbo Tournament. Do you have any other hobbies outside of video gaming? I have had many different hobbies over the years, some creative ones such as technical drawing, but also common interests such as reading and movies. One activity in the last 10 years is weight training at the gym, as I wasn't able to do many sports since I was young due to asthma; I was also underweight then. Now I have improved my fitness level as well and I think my gaming and record setting experience has helped me set goals with that, too. My other hobby from childhood also involved record setting in some shape and form; which is growing sunflowers. It is normally difficult to grow the best specimens in the UK but I have spent the last 3-4 years in the garden working on this which I find relaxing if the weather is nice. Thanks to Sami for taking the time to speak to us. Possibly one of the best things about nintendo life is that they do interviews with awesome people like this. Great read! All the best from Portugal, Sami. The top players always make me feel inadequate, but at the same time encourage me to improve myself. With the imminent release of MK8 I'll certainly be doing that. and Here's Leyla too: http://www.nintendolife.com/news/2012/10/meet_leyla_hasso_the_fastest_female_snes_super_mario_kart_player that interview d'awwww! The 19 year old second placer must have been raging! Top tie for a topman. Hm, I never knew Mario Kart had a competitive scene like this. That's awesome. I knew about the time trials, but I thought that was it. That was an interesting read. I highly enjoy these kind of interviews and would like to see more in the future. @Excep7ional Yep the Championships are a big thing now and hoping to grow, check out the related articles as they have been put up recently. More news on the World Championships soon. All: Much appreciated for the rest of the comments, if you have any further questions please feel free to ask. Didn't see the races going on today at Play Blackpool as I was busy hunting for stuff in the stalls, I'll have a look tomorrow if anything is going on whilst toruing the arcade and consoles. @SamiCetinSMK Nice. Now that I know, I may try to get into the scene since I always loved Mario Kart, and found myself to be good at the game. I'm sort of competitive so this just made Mario Kart a whole lot better in my eyes. I only usually play fighters to compete but it's nice to know that I can venture into one of my favorite racing franchise of all time. Also, I would like to congratulate you on all of your accomplishments. Cheers mate, would be great if you got involved in the time trial and racing scene. Play BP has been good so far, some casual racing and record demonstrations tomorrow probably. Then got to prepare for August's world championship pretty much. Keep me posted on FB / twitter when you will do a time trial set on a snes and plans to do any racing. I can't get used to the speed in pal games. Slow motion. Wouldn't pal mario kart require less skill since its slower? This is making me want to try the game not sure if I should buy the VC version or hook up my brothers Snes and find where he put the game. I was at GEEK 2014 and remember them announcing a new world record had been broken. If you want to join the Time Trials, play on either a snes or the original wii vc. SNES preferred. @SamiCetinSMK I'll keep that in mind thanks for the reply, gonna have to also see if the old family TV still works as CRT is the best option right? I’m really pleased with this interview, because it not only conveys @SamiCetinSMK’s passion towards Super Mario Kart, and his abundance of skill at playing it, but it also demonstrates his enthusiasm for engaging with the retro community and in sharing his knowledge of this classic game. @FX102A I hope you got the chance to meet Sami yesterday, I had a number of quality chats with him on the Saturday of Play Blackpool, and he’s a really friendly gamer with lots of Super Mario Kart expertise to share. I was not only amazed by the extent of his driving skills, but at how incredibly consistent he is at demonstrating a number of advanced driving techniques. I definitely recommend that people take the time to meet him at future expos, like at EGX London in September, or Play Expo in October of this year. @Kobeskillz If you get the chance, it’s worth having a read of the comments in the recent Wii U eShop Super Mario Kart review, as there’s quite a detailed discussion about how the PAL vs. NTSC comparisons are not as clear cut in this game (see comments 35, 65, 86, 87, 90, 92 and 94). My name is credited at the top of this feature, but, as is often the case, this interview is a result of the combined effort of Nintendo Life as a team. Therefore, I want to say thank you to @Dazza for organising this one, and to @ThomasBW84 for his editorial work, and to the team for their correspondence with Sami. Of course, I reiterate our gratitude to Sami for the zeal he has in discussing this game. Cheers to him, it was fun to hang out at his tournament stand on Saturday at Play Blackpool, and Sami has really opened my eyes to many subtle intricacies hidden within this game. Nice one! @Jazzer94 Yep CRT will be the best option... zero lag. @JamieO Much appreciated Jamie, was great catching up with you and sharing some of the techniques at Play Blackpool. You have my card still yes? Please drop me an email to my yahoo on there then we can discuss the other projects / write-ups offline. Thanks again. @SamiCetinSMK Excellent news about improving upon two of your NTSC Time Trial records at Play Blackpool. It was a fantastic day on the Saturday, and it sounds as though you had an equally brilliant day on the Sunday. Cheers! @SamiCetinSMK do you know what the twitch link is right now? I could just follow it & then twitch would email me when the stream goes live. I can't say the same for games like GTA.